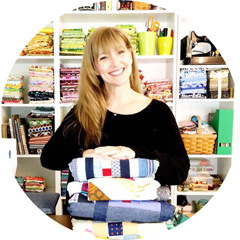 I am so happy to be joining in on the fun for the Blogger's Quilt Festival this time! This simple scrappy baby quilt for a friend is named Babylove. It is simple snowballs and was super easy to put together with the help of an Accuquilt and my son Adam. It is such a variety of different fabrics from Thomas Knauer, Dear Stella, Kokka, Heather Ross, Denyse Schmidt and many others. The batting I used was Pellon and the thread was Aurifil 50wt for the piecing and 40wt for the quilting. The quilting was simple circles around where the corners met. I thought it added something fun by showing off the diamonds created by the block points. I was super happy about the hand binding on this quilt. I do not usually hand bind so I am not the best at doing it. This one looks perfect to me ( happy dance). I am going to enter this one in the Scrappy Quilts Category. Please go and cheek out all the fantastic inspiration at Amy's Creative Side!!! I love the shape connection between your polka-dot binding and your snowball blocks. Looks like you did a good job with the binding. I find that sewing that binding down by hand is such a relaxing final step and time to reflect on making the quilt or who its for or just to veg out for awhile. Very cute! I love how the circle quilting actually makes the snowballs look more square! I'd be super happy if I could achieve binding that looked like that too Kim, it sure looks perfect to me, Good Luck in your scrappy quilt category, I hope the judges agree with us. Snowballs are great for scrappy quilts! Big enough to showcase the fabrics and small enough to hold a good scrappy look :) good job! What a sweet quilt, and great colors/fabrics! I'm happy to see this one again. The combination of fabrics and colors are just wonderful. Great job! ¡¡tomare tu ejemplo para el mio!! !